Where: The new temporary northbound Allen Road ramp is located just west of the old northbound ramp. Significant truck traffic hauling muck will be travelling to and from the Allen road ramps into and out of the launch shaft workzone. Traffic lights and traffic signage are relocated accordingly. For your own safety, please observe and follow signs. Traffic will travel on the south side of Eglinton Avenue West in the vicinity of the Allen Rd. Traffic will continue to be reduced to one lane in each direction at this location during the construction of the extraction shaft and the long term tunnelling operations at the launch shaft. On-going construction of the extraction shaft at the southbound Allen Road ramp on the north side of Eglinton Avenue West will continue. Traffic delays are expected during construction. Please take care when travelling near construction areas. Please watch and obey traffic signs and signals. Underground tunnelling and associated work may continue 24 hours a day, 7 days a week. The contractor will not always work during the extended hours, but may do so at its discretion. Timelines may be adjusted due to weather and unforeseen circumstances. We understand that construction can be disruptive, and we will do our best to keep you informed. 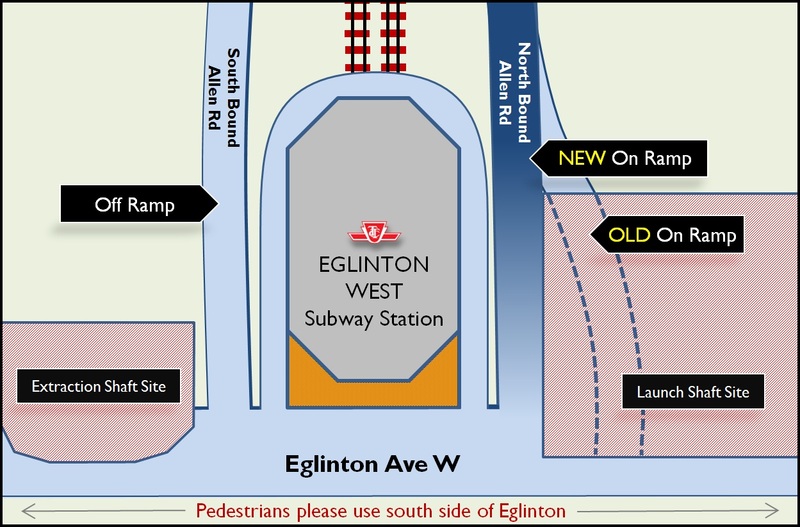 If you would like more detail about this work or any other aspect of the Eglinton Crosstown Project, please do not hesitate to contact us. We thank you for your continued patience as we work to build rapid transit.